My Grandpa was called Fred White. He was a fireman during the second world war and told me how to deal with bullies… he basically told me if anyone hits you bang ’em back twice as hard! He explained to me the different forms of bullying I would encounter in my life and that I was to always stand up for the underdog or those who didn’t have a voice. My Grandpa loved me, he always made me feel special and that I was his favourite, but then again talking to my siblings he made them feel like that too. 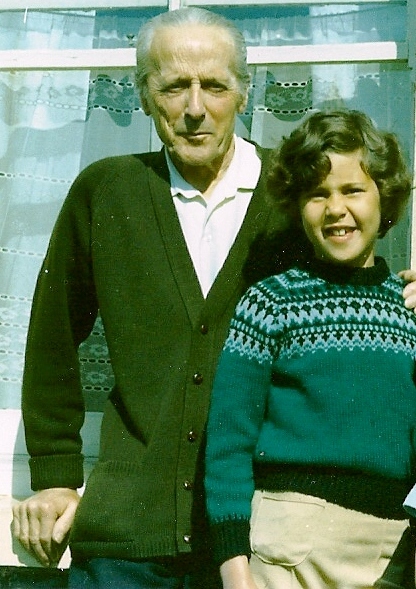 I can only ever remember Grandpa being calm, kind and wise. He died when I was 13 but before he died he lived with us so I got to know him really well and Grandpa set my head straight for what life has thrown at me. He didn’t live to see me become a punk in the summer of ’77 but he would have approved. I’m sure of that. In short, Grandpa was and is the best man I have ever met in my life. I was adopted back in the sixties into a white family and I was from a mixed-race background. That was a bit progressive back then but my Grandpa always loved me and got me the grey elephant cuddly toy you can see in the picture below. 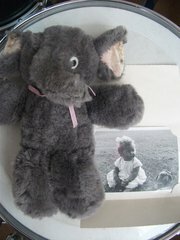 Ele has been with me throughout my whole life, she is 48 years old and travelled the world with me. She has never been far from my side and now resides in my bed. For my whole life I have loved elephants and been fascinated by them and their society. 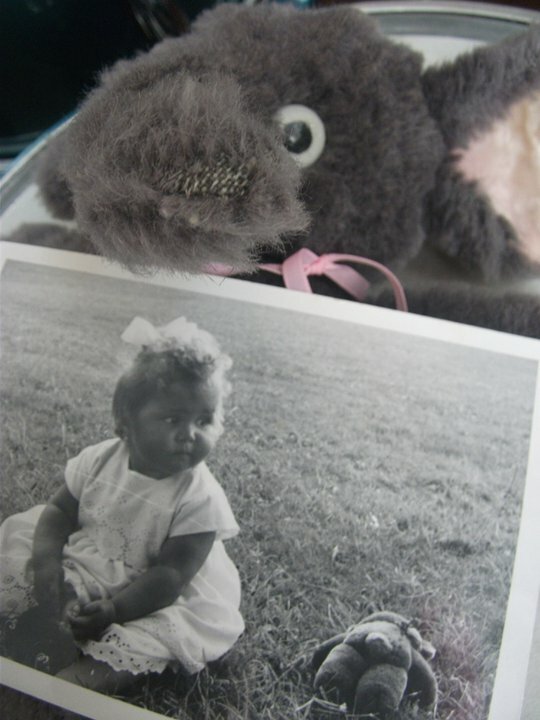 Me with Ele in 1964. My first blog was about getting prepared for a march through the streets of Manchester, UK in support of captive animals. Captive Animals Protection Society (CAPS) does incredible work to free animals in captivity. Between them and the Animal Defenders International (ADI) who investigated the Bobby Roberts Circus and found that Anne (Annie) the elephant was being severely abused and got her freed. This is now an ongoing case against Mr & Mrs Roberts who are currently in the UK judicial system facing charges for Anne’s abuse. Click here for an update. When I first saw the footage of Annie being abused I felt my heart rip in two. Straight away I set about joining the campaign to not only free Annie but to stop the use/abuse of animals in circuses. I am very tempted to put that footage here, but I won’t out of respect for Annie so I will leave that up to you to search for it, and for my sake I never want to see that footage again or refresh the images that are scanned into my memory. Thankfully there is new film of Annie living in the safari park where she now gets the love and treatment she needs to mend the decades of abuse she endured. Click below to see Annie in her new home. So you see the reason I was upset over Annie is that I have an affinity with grey elephants, I dream about them a lot and I am so grateful to everyone who was involved in setting Annie free. Anyway, I just want to say to you that whatever your ‘affinity animal’ is do something to change your affinity animal’s outcomes because as a collective we can change things. To be honest I have quite a few I share an affinity with, and I fight for them all. My Grandpa told me to always speak against what I saw was wrong in the world and for anyone who didn’t have a voice and needed my strength. Find some organisation today that touches your heart. Trust me they will be overjoyed that you want to help them, and they need you if you have an affinity with their cause. Thank you Grandpa for all you taught me about being strong and to fight bullies, you will never know the power of the gift you gave me and the passion to stand up for others. March for all captive circus animals. Getting ready to march for all captive circus animals this Sunday 2nd October in Manchester is my absolute pleasure. We are making our presence known during the Tory Conference so hopefully we will be deemed as adversaries. If we don’t stand up for our fauna bretheren who will? I am passionate about captive circus animals as we are supposed to live in a civilised western society where over 90% of British citizens do NOT want to see animals being forced to perform in a circus. It’s time for the Conservative (coalition) Government to be sensible for a change and pass this resolution to ban the use of captive circus animals for all the great Britons who don’t want animals used and abused anymore at the Circus. I love Captive Animals’ Protection Society as they are truly committed to seeing the ban on the use of animals in circuses and having met them can honestly say this is one of a handful of charities I give my money to… http://www.captiveanimals.org/our-work/circuses. So for now, I can make my banner, and yes it will feature some shocking pinkness, and yes it will be cute and non-aggressive but hopefully say a thousand words as I stand shoulder to four-legs with my fauna brothers and sisters.